Between the book and this blog, there’s no doubt that I’ve already spieled a lot more about Ryan Adams than any sane person should — probably more than enough for one lifetime. 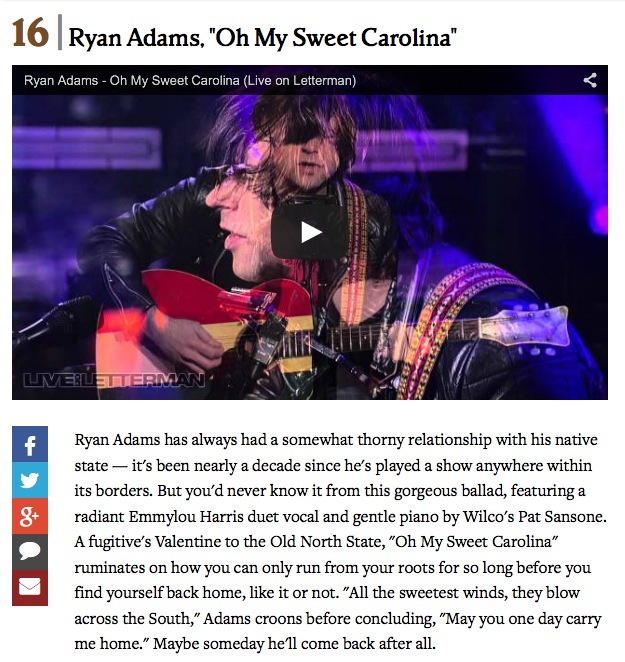 Nevertheless, when Rolling Stone sent out a list of songs they wanted written about for a “25 Best Songs About The South” feature and it included Ryan’s “Oh My Sweet Carolina,” I just could not resist taking that one. They let me have it, so here it is (and also below). The editors decided on the ranking and put “Sweet Carolina” at No. 16. Elsewhere on the list, I also got to do blurbs on Drive-By Truckers’ “Three Great Alabama Icons” (No. 21); George Strait’s “All My Exes Live in Texas” (No. 20); Ray Charles’ “Georgia on My Mind” (No. 2!) and James Taylor’s “Carolina in My Mind” (No. 1, whoo hoo!!). Getting to write about two of my favorite North Carolina-themed songs, as well as the entries that the editors wound up putting in the top two spots on the list, was pretty heady stuff for the likes of little old me.